St. Barbatus was born in 610, in the village of Vandano, near Cerreto Sannita. St. Barbatus received a Christian education, and spent most of his time studying Sacred Scriptures. He had a desire from an early child to become a Priest, and was ordained as soon as his age would allow. The local Bishop immediately assigned him to preaching, which he had a great talent for. Soon after that, he was made the Curate of St. Basil’s Church in nearby Morcone. He caused discomfort with the parishioners there, as he continued preaching on their falling short of living the ideal Christian life. They soon persecuted him, in order to get him to quiet down about their sinful lifestyles. He didn’t let up, and this caused the parishioners to slander his character. It wasn’t long until he was to cease his charitable works because of these slanders. Eventually he returned to Benevento, where he was welcomed back by those that remembered him from his earlier position there. These people were living a Christian life, and loved his spiritual direction and preaching. Eventually they turned to indulging in many idolatrous behaviors, including veneration of a golden viper and a specific local tree. The local Lombard Prince Romuald I, son of Grimoald I, was himself seriously involved in these activities. St. Barbatus regularly preached against these pagan rituals, only to be ignored. He started to tell the people of the city of great trials they would soon suffer at the hands of the East Roman Emperor Constans II, and his army. Shortly after, the army landed in the area and laid siege to Benevento. The people, in their fear, renounced the practices that St. Barbatus had been criticizing. He then cut down the tree they worshiped, and melted the viper into a Chalice for use in the Church. As St. Barbatus had foretold, the siege ended with the defeat of Emperor Constans. The presiding Bishop of Benevento, Bishop Hildebrand, had died during the siege. After the withdrawal of the invaders, St. Barbatus was made Bishop on March 10, 633. He took advantage of his new position and quickly destroyed the remaining superstitious artifacts hidden by the Prince and the locals. In 680, St. Barbatus assisted in a council held by Pope Agatho, and took part in the sixth General Council held in Constantinople in 681 regarding the Monothelites. 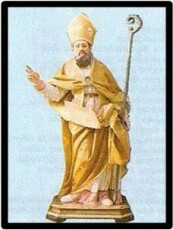 Shortly after that Council, on February 19, 682, St. Barbatus died at the age of seventy. His relics rest in the Cathedral of Benevento. St. Barbatus was born in Vandano, Italy. He was a spiritual child that had a desire to become a Priest. He was ordained as soon as his age would allow, and was very learned in Sacred Scriptures. His first assignment was to preach to the area, something he was very good at. He then was sent to a parish, and eventually became Bishop of Benevento, Italy. He often preached out against the people falling short of living the ideal Christian life, and was often chastised for it. Eventually he prophesied to the people that a neighboring Emperor would invade their city. It came to pass and they were invaded. The people immediately turned from their pagan rituals, and fled to St. Barbatus, embracing the Christian faith. The enemy was defeated, and Benevento was saved, converting to Christianity.